Recently, GlobeIn sent over one of their Artisan boxes and asked if I'd share a review about it here on my blog. Moments like this are when I really do think to myself, "Best job ever." When the adorable little basket arrived, I waited to open it with Ellie, because I knew she would love seeing what was inside. And right from the start I want to tell you one of my unexpected favorite parts of this subscription box: No unnecessary packaging. They really are standing behind their mission to build a more positive world, and one way is by having less of an impact on the environment. Everything that came in the box was tucked sweetly inside the basket with a tote bag folded underneath. And what was inside was a little feast for the senses with rice (complete with a coconut rice recipe), lip balm, delicious cacao nibs, and a little bamboo bowl. The tote bag is the perfect size for groceries or packages to take to the post office and books to and from the library (which is probably how I'll be using it). 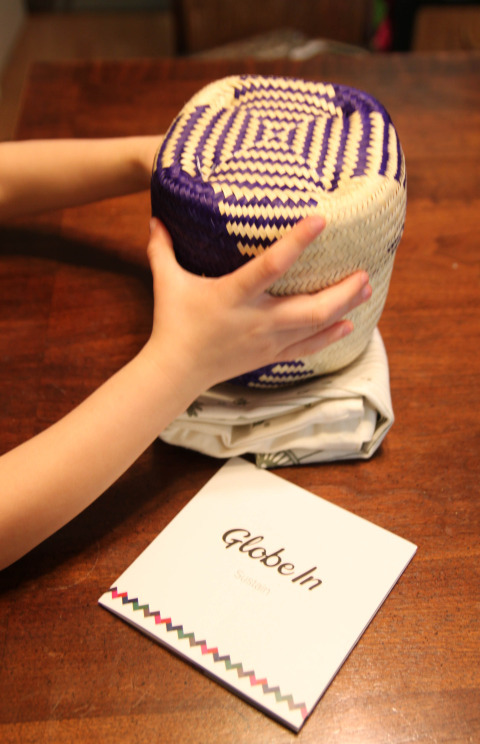 A little information about the GlobeIn Artisan Box. It's a subscription box where each month you receive a themed collection of artisan­-made products from around the world. The products are often organic, fair­ trade, and support artisans and farmers from around the world. Each box also includes stories about the origin of the products product as well as the stories of the artisans and farmers. This special touch of including the stories makes me so happy. And these stories gave me an unexpected opportunity to talk with Ellie about what it means to buy handmade from people around the world. Because of my business and my studio in our backyard, she already understands that some people go to work to make things by hand for other people, but explaining how we can positively impact the world when we purchase handmade items wasn't a conversation I'd really had with her yet. She was so interested in reading the stories in the little booklet and learning more about the people who made these items that were now sitting on our kitchen table. It was awesome. Special just for you: If you want to gift yourself or someone else a subscription to the Artisan Box, you can use coupon code LIZ for 25% off a 3-month (or longer) subscription! Please note: GlobeIn gifted me one Artisan Box in exchange for this review. This post is not sponsored by them and the opinions shared are my own. Links throughout are affiliate, which means I receive a small commission if you choose to purchase anything through these links. Photo at the top of this post provided by GlobeIn.